January 28th, 1917 Tombstone Epitaph headline announcing legislative concern over the proposed state flag design. This design that “looked too much like the Japanese emblem” was adopted as Arizona’s official state flag the following month. A full five years passed between Arizona’s admission to the Union and its adoption of an official state flag. A variety of factors – legislative bickering among them – led to a half-decade elapsing before the “Baby State” had a standard of its own. While the design approved by state legislators in 1917 is well-regarded today, as evidenced by the North American Vexillological Association honoring it as one of the best flags in North America, it initially faced serious opposition. In the end, legislators passed a bill adopting a design bearing “the copper star of Arizona rising from a blue field in the face of a setting sun” as the state’s official flag. 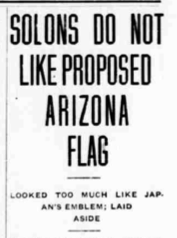 Though Governor Thomas Campbell declined to sign the bill because, as speculated by the Arizona Republican newspaper, “the flag did not measure up to his ideals of what a state emblem should be,” the bill became law after five days of gubernatorial inaction. Campbell was ousted from office in December of 1917 following a court decision declaring George W.P. Hunt the victor of the contentious 1916 race (Campbell would return to the governorship in 1919). However, the Arizona state flag made official by his inaction flies over the capitol building in which he served to this day. Who was Dr. Grady Gammage? Copyright 2012-2016 by John Larsen Southard, LLC.